Electric Pi Journal - Comic Life: A Serious Application? 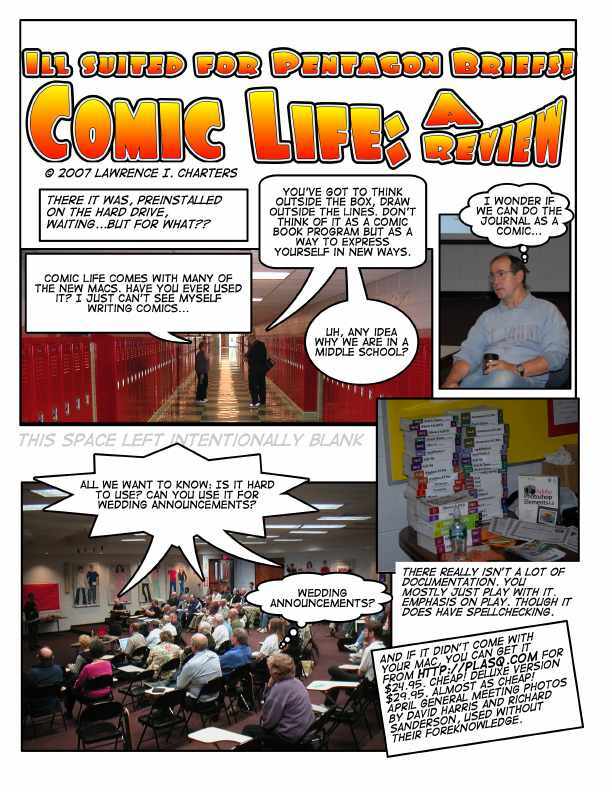 Comic Life: A Serious Application? Apple has been bundling Comic Life with many new Macs. Exactly how long they have been doing this isn’t clear, nor is it clear which new Macs are getting it as part of the installed bundle. But whatever the answer, one thing is clear: Comic Life is seriously undermining the Mac’s reputation for seriousness. Already considered a joke among those serious people who determine what is serious and what is frivolous, the Mac can ill afford to be lumped in with the word “fun.” Computing, as everyone who is the least bit serious about the subject knows, must be work. It must be painful. It must make you struggle. It must make you sweat (at least figuratively; sweat makes keyboards yucky). Computers – hardware and software – must be hard to figure out. They must be used for serious purposes. A review of Comic Life, done in Comic Life. Click on the image for a larger size. So what was Apple thinking when they started bundling Comic Life with new computers? It is absurdly easy to use. While there is a manual (at least, in theory there is a manual, built into the Help menu), there is no reason to use it, and how serious can a program be if you don’t need to read pages of directions to operate it? It is either free (bundled) or $24.95, and what kind of a serious price is $24.95? Comic Life Deluxe is $29.95, which looks like a misprint; a serious deluxe anything should run into the hundreds of dollars. Comic Life allows you to easily create those silly frames (78 in the regular version, 322 in the deluxe version), ridiculously styled type (7 in the regular version, 40 in the deluxe version), and childish “thought balloons” that you see in comics. Can you use it to figure out the national debt? No – but the regular version has 78 thought and speech balloons and the deluxe version has an appalling 180 styles. Seriously, do right-thinking people have 180 different ways of speaking and thinking? Of course not. The Comic Life interface is very simple: see something, drag it into position. The photos on the right are of the inside of the Library of Congress, and have nothing to do with the cartoon on the left. Click on the image for a full-size version. You can change any object – a template, a photo or image, a word or phrase – in almost endless ways, adjusting size, color, position, shape, and other attributes. This is utter chaos! After using Comic Life for just a few minutes, you end up with garish text splashed across the page with graphics and photos thrown in with no thought to order. In the modern global economy, such lack of restraint cannot help but give people the wrong impression if Apple is to promote the serious nature of the Mac. 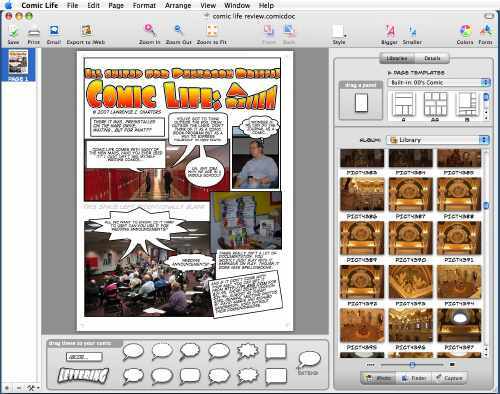 Comic Life automatically integrates with iPhoto, and allows completed work to be printed on paper, E-mailed, exported to iWeb, or exported as HTML, JPEG, TIFF, PNG, or QuickTime. Such wholesale promiscuity will soon lead to comics showing up not only all over the Web and in print, but in people’s mailboxes, in videos, and who knows where else. Soon, the undisciplined may even be tempted to use Comic Life to write, say, a software review. As you might suspect, those silly Aussies seem to be behind it. Harrumph.